Eastleigh’s season is up and running with a highly positive and hard fought draw against promotion favourites Woking. After a run of three straight defeats from the Spitfires’ opening three games, Ian Baird’s side put in a really strong team performance to keep out Garry Hill’s side and ensure a valuable clean sheet. Eastleigh’s defensive display was pleasing, whilst at the opposite end Richard Gillespie and Sam Wilson so nearly stole all three points for Eastleigh with efforts late in the game. The starting eleven was the same side that were defeated 4-0 by Tonbridge Angels at the weekend with the exception of new loan-signing Henrik Breimyr, who replaced Jordace Holder-Spooner. Breimyr, a young Norway under-18 international, arrived at the Silverlake Stadium from Aldershot Town just yesterday but was handed his debut this evening where he took up a central midfield role and turned in a good performance. 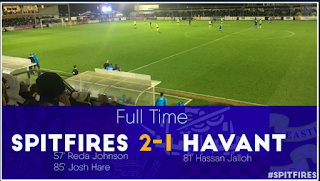 Former Havant & Waterlooville forward Guiseppe Sole had the first chance of the game after a cagey opening, when he forced Gareth Barfoot into a low save in the 8th minute. Sole’s effort had to tipped around the post for a corner kick. In the 20th minute, Andy Little so nearly gifted Eastleigh a goal when he was caught in two minds when throwing the ball out from the back. The result was a calamitous error that could have been punished as the ball was dropped straight into the path of Andrew White. The young Eastleigh attacker couldn’t quite take advantage of the situation, after a Woking defender recovered well to spare his goalkeeper’s blushes. The Spitfires had a good spell of play where they appeared to have the visitors rattled and under pressure at the back. White’s teasing, low cross at pace was only half-cleared into the path of Ross Bottomley around 25-yards from goal. The Eastleigh utility-man let fly with a clean strike that took a deflection and had to be turned over the cross bar, as the ball headed for the top corner of goal. Eastleigh then had the ball in the back of the net from the corner that followed, but it was quickly ruled out for a foul on the Woking goalkeeper. Woking had an opportunity to get a strike at goal in the 31st minute when Danny Smith was alleged to have handled the ball in a dangerous area just outside the box. Guiseppe Sole will have been disappointed with his free kick that sailed high and comfortably away from Barfoot’s goal. Moses Ademola had a free header six minutes before the break, but Barfoot was in the right place at the right time to make a good save. As the half came to a close, Ross Bottomley (who had a solid game at right back with a number of important tackles) turned his ankle. Bottomley was unable to continue due to the injury, so Jordace Holder-Spooner was sent on in his place. Danny Smith switched to right back and Jamie Slabber took up a more central midfield role. On the stroke of half time, Woking’s Jack King came close to breaking the deadlock with a left foot half-volley that flew just inches too high of the target. Eastleigh will have been more than pleased with their first half display, having held their own and having a couple of bright moments during a goalless first half. After the break, Woking had the first opportunity of the second half when Joe McNerney came close with a near post shot that went just wide in the 53rd minute. Eastleigh were unlucky not to score through Andrew White moments later, following good play by the powerful Jordace Holder-Spooner, who picked out a good cross. White’s left foot effort was scooped up and claimed by Andy Little; but it was a positive, attacking move from the hosts on the counter attack. On the hour, Eastleigh were on the front foot again, this time Jamie Brown's clipped pass into the danger zone was just beyond Jamie Slabber's outstretched leg. Woking pushed the Spitfires hard towards the end but Eastleigh stood firm and resolute. The unsung hero at the back for me was Andy Forbes who won every header and looked so assured and competent alongside Tom Jordan at the heart of the Eastleigh defence. In the 71st minute McNerney's goal-bound header hit his own player on the goal line from a corner kick. 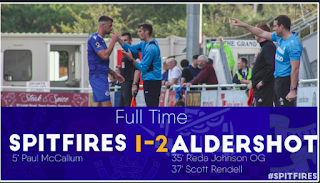 Meanwhile Eastleigh conjured up a chance of their own twelve minutes from time, when Frankie Raymond’s 50-yard cross-field pass from left back to find the run of Holder-Spooner led to a chance for Richard Gillespie. Eastleigh must have felt they had scored to take the lead but Gillespie’s close range effort was clawed back off the goal line. A slightly better contact on the ball and it would have been a goal. End-to-end action towards the end of the game made for an exciting finale to the encounter. Woking went straight up the other end of the pitch and almost scored through Elvis Hammond, who was thwarted by the ever-reliable captain Tom Jordan who scrambled the ball away to safety. Gareth Barfoot stayed alert to the very end to keep his clean sheet in tact, as he tipped a long range shot from Paris Cowan-Hall around the post in the 87th minute. From the resulting corner kick, Woking fired a header into the side-netting. Promising youngster Sam Wilson so nearly stole all three points for Eastleigh with another good cameo appearance off the bench. Wilson showed good feet at the edge of the penalty area to make room for a fine, curling shot that had the keeper beaten and came so close to finding the net. It would have been the perfect end to the game for Eastleigh. The match came to a close with Barfoot showing safe hands once more, this time from a Guiseppe Sole free kick. Eastleigh will be pleased with the point and well-earned clean sheet. The team spirit and work ethic shone through for all to see. 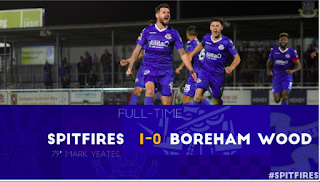 Should the Spitfires turn in another performance of this standard, it will only be a matter of time before the club’s first win of the campaign. Next up for Eastleigh, is a Friday night away trip to Dorchester Town.